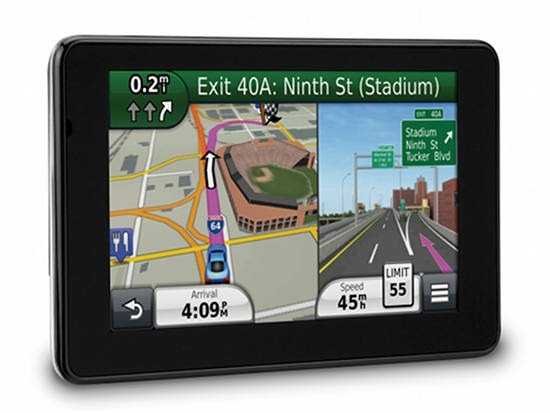 The Garmin nüvi 3590LMT is the company’s new top of the line auto navigation unit. As part of their Prestige series, this model basically offers the same feature set as the nuvi 3490LMT, but with a larger 5″ screen. Which means you get a bevy of customization options, the new Exit Services feature, HD traffic and a large glass capacitive touchscreen. Unfortunately, the 3590LMT doesn’t feature the same super-thin form factor as the 3490LMT. So instead of that model’s svelte 0.35″ thickness, the oversize 3590LMT comes in at 0.5″. Probably not a deal breaker for most folks, but if you’re looking for something thin to slip into your minimalist purse, this probably isn’t the nuvi for you. Jeff Carpenter has some comparison photos on his blog. Note though, this model is slightly slimmer than the 0.6″ thick nuvi 2595, which also features a 5″ screen. So yes, this is indeed the thinnest 5″ nuvi on the market. Just like other 3xxx models, the 3590LMT sports a multi-touch capacitive glass display. Capacitive screens repsond to the slightest touch, unlike resistive screens which require a bit of pressure. One difference between the 3590LMT and thinner 34xx and 37xx series – I don’t think the 3590LMT runs as hot as those models. Also like the rest of the 3xxx line, the 3590LMT features a powered mount. In the picture below, with the suction cup removed, you can see the additional speaker that is part of the mount. The nuvi 3590LMT powers off and on automatically when connected to the charger in your car. When you press the power button to turn it off, it actually goes into sleep mode. According to the manual, “a battery charge lasts for weeks” in this mode. The advantage here is an almost instantaneous power on from sleep mode. To fully shut down the device, hold the power button down for several seconds. It’s also worth noting that the nuvi 3590LMT features a tri-axial compass, which allows the screen to rotate automatically. But it also makes this a good device for pedestrian navigation. There are nine different dashboards available on the 3590LMT. Basically, these are data field layouts. They are accessed via Settings > Map & Vehicle > Dashboards. You can see one in the image below. While not a new feature per se (the presentation is a bit different here), tap Routes and you’ll get your choice of faster time, shorter distance and less fuel routes (according to the manual; they aren’t labeled). Voice command functioned well during my testing, probably better than on the 3490LMT and as good as the on the 2×95 series. In addition to the options shown below, there are also commands for Detour, Volume, Phone and Brightness. You can do one shot address or POI entry on the 3590LMT. Just say Find Address and then rattle off the entire address. Another improvement is that Find Place seems to work with nearly any POI in the database now. The nuvi paired with my Galaxy Nexus on the first try. Sound quality was average compared to recent models. On the other end of the call, you could clearly understand the person using the nuvi, but there was some background hiss. The nuvi was also slow to fully connect with my phone at times. The 3590LMT offers a SafeText feature, which allows texts to be read aloud to you. This requires a phone with Bluetooth MAP (Message Access Protocol) support. At this point, there appears to be only a few Android and Blackberry phones with this capability, my Galaxy Nexus not among them. The 3590LMT comes with the GTM 60 traffic receiver. Unlike most other lifetime traffic models from Garmin, this one is not ad-supported. It uses an HD-radio delivered traffic network, which Garmin is referring to as Digital 3D Traffic. This should mean faster updates (every 30 seconds) and additional coverage of smaller roadways. During the several weeks I tested the nuvi 3590LMT, I noticed no glitches, routing errors, slow map redraws, etc. The only problem I had with it was when trying to geocache, something this unit isn’t really designed for. A couple of times when trying that, it failed to update the distance to the cache. As with the 3490LMT, the unit responded to taps without noticeable delays. Menu responsiveness was fast. POI searches were reasonably fast, certainly better than on previous generation nuvis. Routing speed has also been improved. Recommended. HD traffic reception seems to have been improved since it was initially released on the nuvi 3490LMT. Voice command performance seems better than on the 3490LMT as well. The only downside is that the 3590LMT is a little disappointing in terms of Bluetooth functionality, but hopefully that will be fixed with a future firmware update. Otherwise, this is the current king of the hill as far as nuvis are concerned. If you can afford it, I say go for it. I have a Garmin 3590LM. Whenever I put the unit in the power mount the screen goes dark. When I take it out the screen lights up again. Its not the power mount or the cable because I tested the mount and cable with another 3590LM and they work fine. I don’t know the answer, Bryan, but I can make guess. Since the power cable worked on a different unit AND the unit works properly when separated from the unit, we know it has to be at the connection. Something is either loose and/or dirty at the contacts — on the unit side since the cord has proven to be undamaged. I really wish I had more to offer… well, there is one other thought; did/does the unit work properly on the other unit’s power mount? Easy. Call Garmin Customer Service. They have been very helpful to me on several similar wacky things, knew right away what to do. Thought-provoking post . I was fascinated by the information , Does anyone know if my business would be able to grab a fillable IRS 1040 – Schedule E example to work with ?